Photographer Jack Boucher (1931-2012) devoted himself to documenting and preserving America’s architectural heritage. 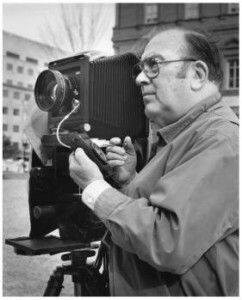 During his roughly 50 year career, he took more than 55,000 photographs of an estimated 7,000 to 10,000 buildings, to include the oval stairway of the Metropolitan Opera House in New York; mansions in Newport, Rhode Island; old New England mills and armories; and the Wheeling Suspension Bridge in West Virginia. He traveled to 49 states, the Virgin Islands, and Puerto Rico, carrying hundreds of pounds of photography equipment. He spent three weeks in Kalaupapa National Park on the Hawaiian island of Molokai living among the remaining residents of the former leper colony and photographing this historic settlement. Explaining the basic philosophy driving his work, Boucher said simply, “I regard the building I’m doing as the most important one in my life even if it is a single-seat log outhouse.” His pictures not only documented the evolution of building styles, they provided a useful tool in restoration and renovation efforts. Photographers, preservationists, and historians praised Boucher for his ability to capture not only a building’s appearance but its spirit and purpose as well. Jack Edward Boucher was born in Buffalo, New York, in 1931 and raised in Atlantic City. He began his career as a photo lab technician and engraver for the Atlantic City Tribune. The next year he worked 18 hours non-stop photographing a hurricane that battered Atlantic City in 1950, standing in swirling waters up to his armpits to capture the chaos. His photos ended up on the front page of the Tribune. In 1952 he was hired as chief of photography for the New Jersey Garden State Parkway to photograph the construction of the parkway and the historic structures surrounding it. After six years on that project, he went to work jointly for the NPS Washington Branch of Still and Pictures and the Historic American Buildings Survey (HABS) in Philadelphia. From 1958 to 1962 he documented one of the most significant periods in NPS history – Mission 66, a design and construction program to revitalize the national parks through a massive 10-year program of capital investment. In 1963 he became chief photographer for HABS, and indeed for many years he was the program’s sole photographer. Three years later Boucher left the NPS for two years to supervise New Jersey’s state historic preservation program. In 1970 Boucher returned to his HABS job in Washington. From 1971 to 1978 he also performed all photography work for the Historic American Engineering Records (HAER). Over the years, he taught students about photodocumentation of historic buildings and authored several books. One of this fearless photographer’s last NPS assignments was stero-photodocumentation of the Washington Monument, which required him to hang out of an open door of a helicopter while it circled around the shaft. He retired in 2009 and passed away in 2012. When asked why he did the work he did, he explained, “I’m my own boss. I get to travel. My expenses are taken care of. … I feel I’m doing something constructive, something that will help humanity.” Boucher’s work had, and continues to have, great impact. His photographs appeared in dozens of major newspapers and magazines, and thousands of his negatives and photos remain in the permanent collection of the Library of Congress.